As Copthill embraces the excitement and festivities of Christmas, it is time to reflect upon the achievements of all our Lower School children and the progress that they have made throughout the autumn term. How fast are the years going by? We are now speeding towards the end of another year and waving goodbye to 2018 and I must admit we have packed in a huge amount of activities in the last term, considering it’s been 14 weeks since we came back in the last days of summer. The Reception children are now fully integrated into the whole school and this term we introduced Form Captains and School council members throughout the school and the five year olds take their roles very seriously. Over the term, our school and its grounds have provided an enriching and stimulating environment to nurture all of our children and develop a successful ‘Copthill Learner’. The Early Years’ Foundation Stage provides the fundamental building blocks for our Copthill Curriculum delivered through the Characteristics of Effective Learning, which take into account the way and style in which individual pupils learn. Children are encouraged to explore, investigate and think critically in order to develop their curiosity and fascination of topics to which they can relate. 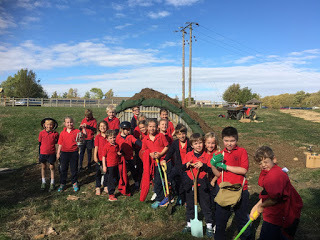 Our Lower School curriculum builds upon these solid foundations creating extensive opportunities to become independent explorers and motivated learners. Recent topics studied by our Lower School children demonstrate all aspects of a ‘Copthill Learner’ within our curriculum framework. Diwali, Hanukkah and Christmas topics alone have provided situations where children can behave as responsible citizens, embracing a variety of cultures and beliefs. They have proved themselves as problem solvers, showing determination to find out information in order to demonstrate their knowledge and understanding. Our creative thinkers have shown curiosity and imagination while the reflective learners have become efficient at evaluating their own learning while setting themselves future goals. During the Christmas period children have shown great comradery as team players supporting each other through plays, carol services and festive events which have been appreciated and enjoyed by many. We have so much to celebrate and not just during our Celebration assembly on a Friday but every day. Being a ‘Copthill Learner’ is so much fun! 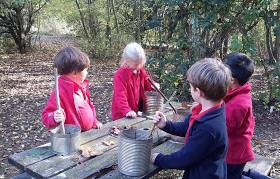 On top of the excellent teaching that goes on in the classrooms the children have had various opportunities to extend their learning be it through visitors bringing their outside knowledge to us or the wonderfully led in house outdoor sessions brilliantly supervised by our Forest School staff. We have also welcomed Philosophy into our classrooms this term led by Jason Buckley. The children have discussed such issues from ‘Can robots ever take the place of humans’ to playing ‘The Naughtyometer’, where each group of players arranges their set of cards from most to least naughty - this game certainly got the children and the teachers thinking! The children have met their buddies, played with toys from the past, dressed up as pirates, hosted a pirate party, taken a trip down to the ‘River Nile’, dug for England, built an Anderson Shelter, and are now busy preparing for a Nativity play and a Christingle service - just a normal few weeks at Copthill! As we start winding down after a busy term we start looking forward to 2019 and of course 50 years of Copthill. I know there are many exciting plans in the pipeline and I have prior knowledge that the Teesdale family are looking forward to celebrating this milestone with you all. As I sign off I would like to wish all our families in Lower School a very Merry Christmas and a Happy New Year and we can’t wait to do this again in January! 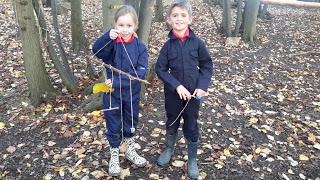 This term in Reception we have been learning all about our letters, how to form them correctly and finding objects that begin with a certain letter on our outdoor adventures! During our 'd' activities we made dinosaur masks and painted d's with dinosaur footprints, and decorated doughnuts and played with dinosaurs. Great fun! We had a fantastic time in the forest making wands and protecting wildlife over the winter months. We made some hedgehog homes in the forest so that they could be warm and hibernate over the winter months and celebrated with hot chocolate! What an exciting week! Mrs Wass, 'The Toy Lady', visited us with a huge array of old fashioned toys for us to learn about and play with. We had a super time, and then we had a visit from 'The Philosophy Man' which got us really thinking and talking about our ideas of how to program a robot to know the right way to behave as a human, and not the wrong way. 1O have become authors and have written and published their own Rama and Sita story book. 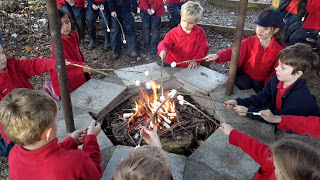 In Forest School we used the book and acted out the story with masks, created clay divas and toasted marshmallows on the fire. In Maths we have been continuing to learn where to accurately position the hour and minute hand on the clock to tell the time for o'clock, half past, quarter to and quarter past. We have also been finding lines of symmetry on 2D shapes. Continuing with our Pirate theme, we have been looking at characters in another exciting Pirate book and retelling the story from their point of view. We also have had great fun making hard tack biscuits with added weevils for us to share with our delicious grog in Forest School. We also made some wonderful pirate bandanas using, pens, feathers and raffia. 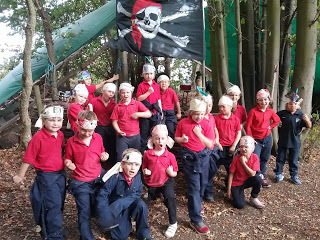 We thought we looked like real Pirates and even managed to act like them too! 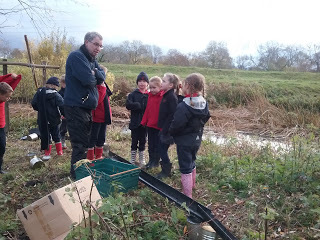 Forest School was spent down by the 'River Nile' one week for 2D and 2F. We were busy taking water out of the river using similar methods to the Egyptians. TutanCambell has made us our very own Shaduf to help us. 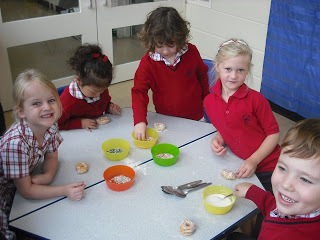 The children also made some Egyptian bread with Cleo Donaldson which they found very yummy, especially when it was dipped in honey! The fire warmth from the fire was most welcome during the baking session too. 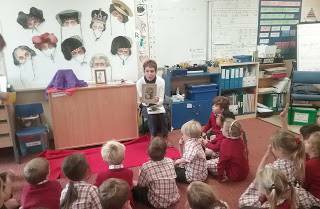 We also had a special visitor from Year 4, who's great-great-grandad's cousin was an English Egyptologist and archaeological photographer. Harry Burton is best known for his photographs which he took during the finding of Tutankhamen. Not only did we have that amazing presentation, but we have also had some children from the class present their amazing research on Ancient Egypt that they have been busy preparing at home. What a great afternoon the children spent with Mr Teesdale helping build an Anderson Shelter. There were genuine Warden hats to be worn, gas masks to look at and an air raid siren which could be heard all over the school! The children filled sand bags to stop the shelter from flooding and it was great to see Mr and Mrs Teesdale Snr make a visit and relive some childhood memories. We made it to December! Christmas always seems to come a little early in school and we try to keep the children's excitement down but we do get a little excited ourselves! We looked at how playscripts are written and the children created their own dialogue for Cinderella, and we have seen some budding playwrights and actors emerge!